Open water can’t get here soon enough. We decided to go check out the Little Indian Sioux River. The river south of the Echo Trail was still frozen, but we had some luck heading north. We made it all the way to Upper Pauness. We couldn’t quite get to Lower Pauness, but I bet in a day or two you could. The portage trails are snow covered and icy in spots. Portaging was a little sketchy, but we took our time and made sure we had good footing. This transitory time of year reveals temporary treasures that can only briefly be appreciated outside of memory. Cameras only collect these beautiful things out of context, and so with imagination we can place ourselves into their stories and claim part of the dialogue as our own. Ely unveils these gifts both interesting and simple after six months of seeming sleep under a blanket of snow. Crayfish… or Crawfish boil, Crawfish roll, Crawfish soup, Crawfish in butter and more butter, Crawfish with Linguini. Any of these remind you of Forrest Gump’s buddy Bubba? It’s been five years since we’ve been able to offer this variety of cosmetic blem paddles at a substantial discount to you. They aren’t going to last long, so if you see something you like below, just click on the picture and it’ll take you right to the paddle page so you can pop it in your cart. Our Friends at Bending Branches make excellent paddles! as they mock the waterfall dropping tears from the forest floor. in the surface pool ahead. 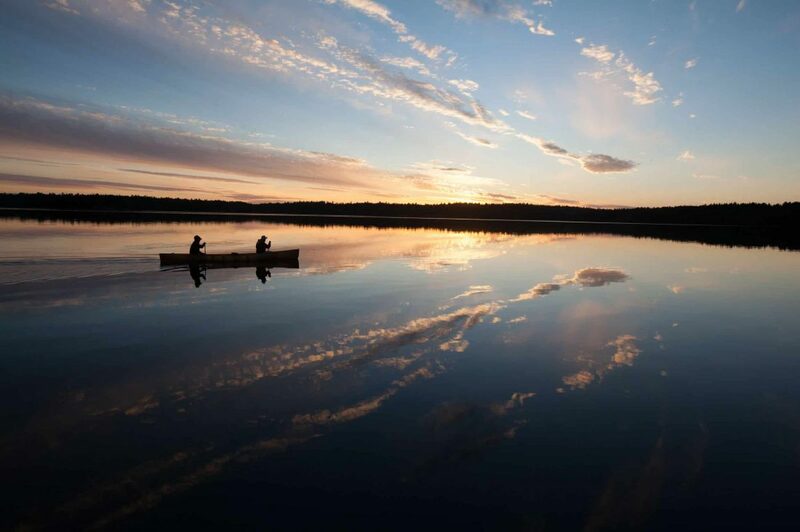 If you are itching to see what canoe camping is all about and you’ve had enough of winter call Drew Brockett or Adam Macht today to begin planning your adventure in the Boundary Waters 1-800-223-6565. Or click here to find out more! Skiing and biking on the lakes when we can’t paddle is great exercise and great fun. You really couldn’t get lost in the fog on Burntside Lake yesterday (April 6th, 2019) if you just follow your tracks home; skiing or biking. While the streets and sidewalks of downtown Ely are void of snow, there’s still snow cover in the woods so we deciding to go walking on the Bass Lake Trail. With the exception of a few spaces like in the above picture, the trail to Bass Lake (right arm) is crunchy snow for the most part. Spaced in between is an occasional dry spot or icy spot where the sun has come through the canopy above and melted the snow pack. Adam and Joe took to the trail yesterday to search out open water. Optimistically, they took a canoe along. The nearby rivers were obvious choices when we have upwards of 2 1/2 feet of ice still on many lakes. The following is their day-trip report. It was a pretty good adventure for the first paddle of the year in a canoe. We want to stress that safety always comes first and this time of year that includes packing for weather changes, canoe dumps (woah, that water is cold) and possible injuries due to unsure footing. With Spring now in full bloom, everyone is venturing outside again and taking camping trips with their friends & family. Which makes it the perfect time to start thinking about a few gifts you can give to someone with a spirit for adventure and a zeal for the outdoors. Duke Cannon have quickly become a modern mainstay in men’s grooming circles due to their direct & robust masculine style. With notes and aromas infused with real Buffalo Trace Bourbon, this beard kit falls right in line with that declaration of manliness and doesn’t skimp on the practical side of things either with a hearty selection of oils, balms, and soaps that are sure to keep you clean and smelling great all day long.